Morels and several other fungi (all members of the order Pezizales) are known to produce their mushrooms in recently burned soil, whether it's the result of a nice little campfire or an entire forest going up in smoke. The fire creates the right conditions for the fungus, which lies beneath the ground and so protected from flames and heat, to send up mushrooms. These mushrooms release spores into the environment, and the circle of life continues ever onward. In the case of morels, it's thought a forest fire does two things. 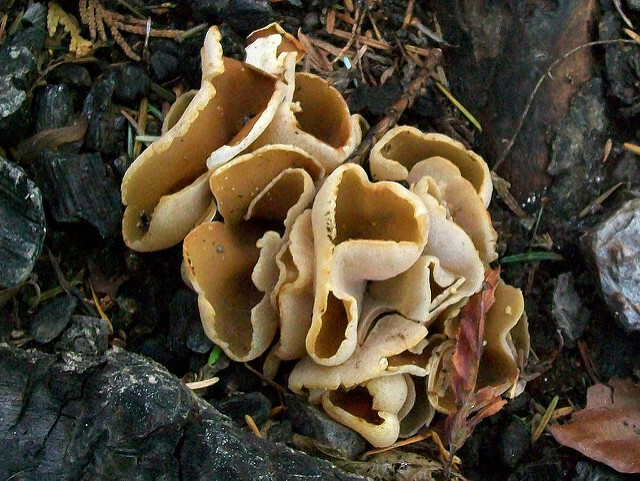 Firstly, it damages or kills the trees the fungus obtains food from while growing underground, which is thought to signal mushroom production. Secondly, it helps to clear out the plant litter (leaves, twigs, etc.) 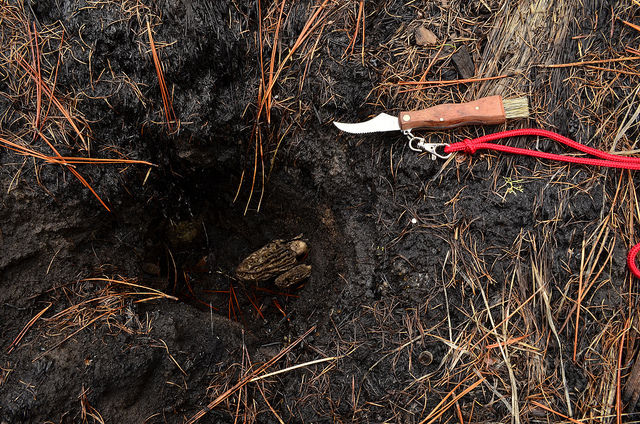 covering the forest floor, giving the mushrooms an easier path to the surface. 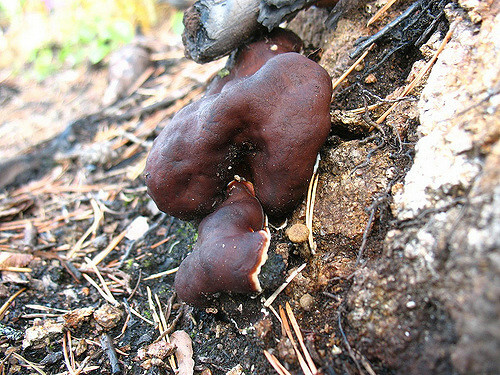 The cup fungus Geopyxis carbonaria tends to show up in the same fire-damaged forests as morels. 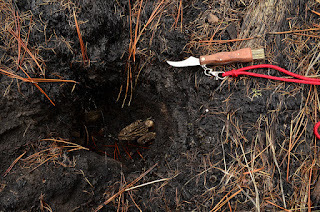 It appears earlier, so it might be a useful guide for where morels (one of the major products of North American forests - hundreds of tonnes are harvested each year) can be found. Whenever I'm working on a new post, I like to take a bit of time to check in on the stats for this blog. I'm particularly interested in what people are typing into their search engines to find their way here. For whatever reason, a post I wrote about what poisons smell like is very popular among users of the Internet. I'm taking this as a sign that people like to read about smells, so I thought I'd look into a couple of odour-related search queries via which people have found this blog. Members of the genus Chara are plant-like green algae found in lakes, rivers, and ponds all over the world. They have fun names like muskgrass or skunkweed on account of their intense unpleasant odour, which has been described as vaguely resembling that of garlic. Many sulfur-containing organic molecules (take for example, diallyl disulfide) tend to smell like garlic. Chara globularis is known to produce at least two organosulfur compounds, 4-methylthio-l,2-dithiolane and 5-methylthio-l,2,3-trithiane. Both can inhibit photosynthesis, so I'm guessing they're produced by the algae to help it compete with other sun-using aquatic organisms. Yes, at least one pesticide does indeed smell like fish. 2,4-D is herbicide discovered by the Allies during WII (fruit of their efforts to develop new chemical weapons) and used by the US during the Vietnam War (as an ingredient in Agent Orange). What makes 2,4-D so useful is it's way less toxic to grasses compared to other plants, meaning it can be applied to lawns and cereal crops in order to selectively disrupt the growth of their competitors (AKA weeds). While it's good at what it does, 2,4-D does not dissolve well in water. To fix this, chemists have played around with it a bit over the years. One of the more successful modifications was a salt, 2,4-D dimethylamine. It's very good at dissolving in water, but has an intense fishy odour because it contains a small amine. Amines are derivatives of ammonia found in, among other things, raw fish. Cyclosarin consists of a phosphorus atom attached to atoms of carbon, oxygen, and fluorine, as well as a ring of carbon atoms. Carbon tetrachloride and chloropicrin have no rings but contain a bunch of chlorine atoms. Diborane consists only of boron and hydrogen. Smelling is complicated. We sense odours via the activation of receptors inside our nose, which transmit signals to our brain. Sounds pretty straightforward right? Problem is, there are hundreds of receptor types, and the signals they produce interact with one another in specific ways to form the information passed on to the brain. It's not uncommon for molecules with very different chemical structures to have similar odours, and for similarly structured molecules to have very different odours. This is the fifth and final post in a series on strange substances accidentally or intentionally added to street drugs. When you're done here, check out the posts on alcohol, meth, opioids, and pot/LSD. If a drug is being sold illegally, chances are its sellers have added crap to it in order to make more money. Cocaine is no exception to this deception. 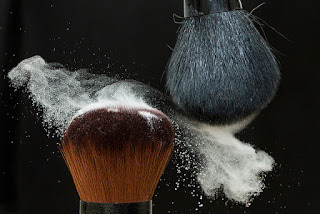 Substances added to nose candy because they resemble the drug but otherwise don't mimic or influence its effects include talc powder, flour, cornstarch, inositol and other sugar alcohols, various salts, boric acid, and microcrystalline cellulose. Snorting any of talc, starch, or cellulose into your lungs can result in an inflammation that disrupts your ability to breathe normally. There are also a bunch of drugs known to be mixed in with cocaine to dupe a buyer into believing they're purchasing a higher quality product. Caffeine is used in this capacity because it's cheap and is a stimulant (it perks you up) like cocaine, albeit a way less intense one. Several relatives of cocaine, including procaine, lidocaine, and benzocaine, are used as local anesthetics to do things like numb your mouth at the dentist before the drilling commences. Cocaine also causes mouth numbness, so adding these other drugs to it can trick customers into thinking they're getting a higher quality product. One of the stranger yet very common additions to cocaine is a drug called levamisole. It's good at killing parasitic worms and also appears to be able to influence the immune system in useful ways. Unfortunately, it also has a tendency to ruin bone marrow and cause a serious dip in the number of white blood cells being made there (agranulocytosis), which is a fantastic way to catch a life-threatening infection. Snorting cocaine contaminated with levamisole can also damage blood vessels in the arms and legs via vasculitis. The role of levamisole as a cocaine adulterant is a bit of a mystery. It's apparently transformed into aminorex, an amphetamine-like drug, when given to racehorses, suggesting it can enhance the effects of cocaine. There's also some evidence that levamisole can act on receptors in the brain to enhance how good cocaine makes you feel. Alternatively, it may simply be added because it's cheap, resembles cocaine, and is often easy to acquire since it's sold as a veterinary medication. Our tour of drug additions to cocaine ends with diltiazem. This drug acts to block the movement of calcium through channels in the outer membranes of heart cells, permitting it to be used to help control an erratic heartbeat (arrhythmia) and other heart issues. 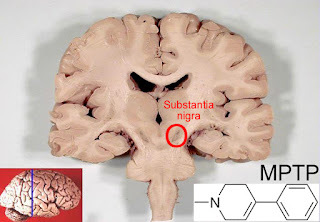 It's been suggested that some distributors decided to add diltiazem to their cocaine in order to negate the negative effects it can have on the heart, which happen to include arrhythmias. Even so, there isn't any evidence diltiazem can provide a protective effect. If anything, it might actually make things worse. Brunt TM, Rigter S, Hoek J, Vogels N, van Dijk P, Niesink RJ. 2009. An analysis of cocaine powder in the Netherlands: Content and health hazards due to adulterants. Addiction 104(5):798-805. Cole C, Jones L, McVeigh J, Kicman A, Syed Q, Bellis M. 2011. Adulterants in illicit drugs: A review of empirical evidence. Drug Testing and Analysis 3(2):89-96. This is the fourth post in a series on strange substances accidentally or intentionally added to street drugs. When you're done here, check out the posts on alcohol, meth, opioids, and cocaine. In the autumn of 2007, hospitals near Leipzig, Germany admitted 29 people after they inadvertently smoked weed contaminated with lead. Yep, some dealer or grower decided it was a good idea to drop a bunch of small lead particles into the marijuana they were selling, presumably to increase its weight (lead is super dense) and thus make mad bank. The average lead content of stashes recovered from the poisoned individuals was 10% by weight, translating into an additional ~$1500 per kg of pot sold. It turns out the center of a lit joint can reach temperatures up to 1200°C, sufficient to ensure a bunch of lead particles will end up in the inhaled smoke and so be absorbed via the lungs (particularly if the inhaled smoke is being held in to maximize absorption of non-lead stuff like THC). Those with lead poisoning showed up to the hospitals with stomach cramps, feeling like they were going to barf, lacking sufficient numbers of red blood cells (anemia), and being unreasonably tired. Most had basophilic stippling and exhibited Burton's line (here's a gross photo), which are classic indicators of lead poisoning. One particularly unfortunate person also had their nervous system seriously damaged by lead. In addition to experiencing hallucinations, this individual exhibited wrist drop because a nerve connecting their spine with their arms stopped working properly. Aluminum and small bits of glass have also been found in marijuana sold on the street. The aluminum was attributed to using unreasonably dirty water to grow the plants, while the glass was thought to be intentionally added to make the pot look better (like it has lots of crystals) and increase its weight. Inhaling hot glass fumes isn't pleasant since they can severely burn your mouth and lungs. Very rarely, dropping acid (LSD) can result in ergot poisoning, which is probably one of the worst possible outcomes for a trip. If the LSD is synthesized from lysergic acid obtained from the ergot fungus (Claviceps purpurea), it may be contaminated with other toxic fungal alkaloids. 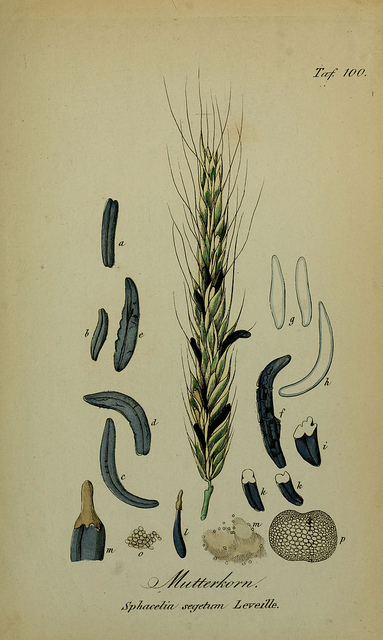 Ergot poisoning (aka St. Anthony’s fire) has been around since we first began harvesting rye and other grains to eat. 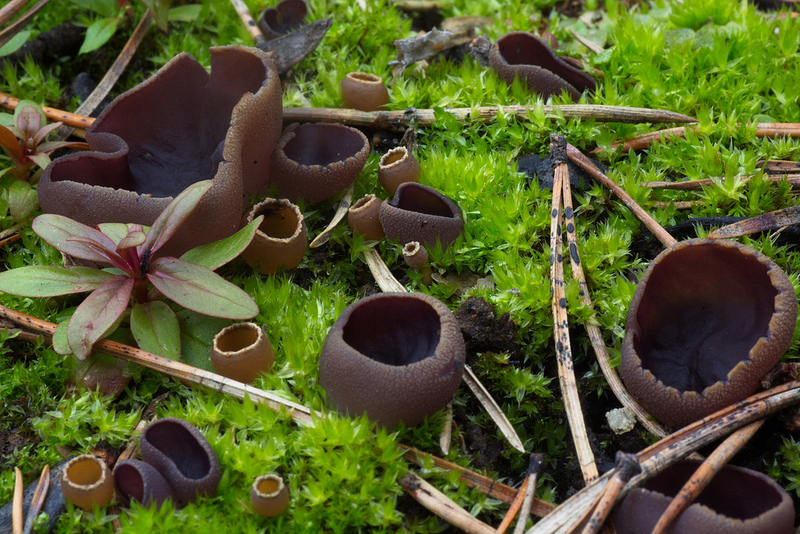 The fungus grows on these plants, producing a bunch of compounds that aren't very nice to the human body. They act on the intestines to produce diarrhea and on the nervous system to produce seizures. Ergot alkaloids also cause blood vessels to constrict, reducing blood (and thus oxygen) flow to the arms and legs (aka limb ischemia, usually accompanied by burning pain). In severe cases, the reduced blood flow can lead to gangrene, where the ends of one's fingers and toes to die, turn black, and eventually fall off. Raval MV, Gaba RC, Brown K, Sato KT, Eskandari MK. 2008. Percutaneous transluminal angioplasty in the treatment of extensive LSD-induced lower extremity vasospasm refractory to pharmacologic therapy. Journal of Vascular and Interventional Radiology 19(8):1227-1230. This is the third post in a series on strange substances accidentally or intentionally added to street drugs. When you're done here, check out the posts on alcohol, meth, pot/LSD, and cocaine. Opioids affect the human body by binding to a group of related proteins conveniently known as opioid receptors. By connecting to these receptors in a certain manner, they convince receptor-bearing cells in the brain, spinal cord, and intestine to do useful things like reduce the sensation of pain (while making you feel warm and fuzzy), suppress coughing, and prevent an onslaught of diarrhea. In addition to opiates such as morphine and codeine, which are naturally produced by the opium poppy, we've figured out how to put together a whole slew of opioids using chemistry. This involves either modifying poppy-produced opiates, as is done to make heroin (from morphine) and oxycodone (from thebaine), or synthesizing entirely new drugs such as fentanyl from scratch. Desmethylprodine, also known as 1-methyl-4-phenyl-4-propionoxypiperidine (MPPP), was invented by a pair of drug company scientists in 1947. 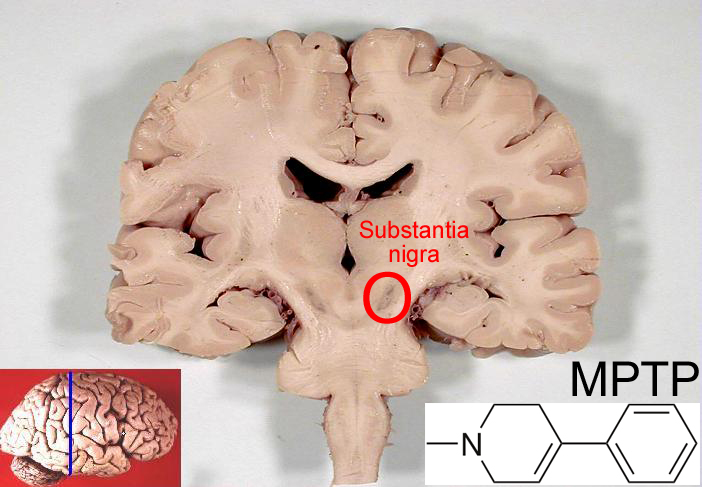 Structurally, it's very similar to meperidine (pethidine, Demerol), another entirely synthetic opioid. Seeing as it wasn't any more effective than meperidine at killing pain, the drug company decided to nix its production. Nearly thirty years later, a chemistry grad student by the name of Barry Kidston read about MPPP and decided to try making some of it for personal use. While the first couple of batches yielded a successful means of getting high, the situation soon devolved into a plot fit for an imaginary TV show I'm calling Breaking Sad. Kidston got sloppy. He apparently started to rush through the chemical reactions used to make MPPP and then didn't purify the drug properly. As a result, an impurity called 1-methyl-4-phenyl-1,2,3,6-tetrahydropyridine (MPTP) ended up in the final product. If you put MPTP in your body, it's converted into a neurotoxic substance with a fine-tuned appetite for destruction. It specifically annihilates dopamine-releasing neurons in a part of the brain responsible for controlling muscle movements, resulting in permanent symptoms resembling those seen in people with Parkinson's disease (parkinsonism). Kidston ended up hospitalized with acute parkinsonism after unwittingly dosing himself with MPTP. Although doctors eventually figured out they could treat his condition with a L-DOPA, which boosts dopamine levels in the brain, Kidston shortly passed away after overdosing on cocaine and codeine. A couple of other folks also ended up in the hospital after using poorly made MPPP and having their brains partially wrecked by MPTP. In at least two cases, the drug was tested and found to consist mostly of MPTP with only trace amounts of MPPP! Heroin, a suped-up version of morphine, is sold on the street mixed with an assortment of materials intended to do some combination of (1) cheaply bulking up the drug so it can be sold for more money, (2) deceiving buyers into thinking the quality of the drug is better than it really is, so it can be sold for more money, (3) altering its effects in a desirable way, and (4) making it easier to use. Inexpensive materials used to dilute heroin include sugars, flour, and talc. Black tar heroin, a heroin-containing mixture named for its appearance and consistency, has been known to be bulked up by adding dirt or ground up paper previously soaked in black shoe polish. Yuck. Quinine, a plant-derived alkaloid used to treat malaria, is used to dilute heroin in part because it also has a bitter taste and apparently produces a sensation in the lungs resembling what you feel after injecting heroin. Another bitter heroin mimic is paracetamol (acetaminophen, Tylenol), which has the added bonuses of also being painkiller, albeit a way weaker one, and having a similar melting point. Fentanyl is an incredibly strong opioid sometimes added to crappy heroin to increase its potency. Then there's caffeine and procaine, which when mixed with heroin cause the opioid to vaporize at a lower temperature, making it easier to smoke. Additionally, procaine is a local anesthetic (a numbing agent) and so can reduce any pain caused by injecting the drug. By far the nastiest accidental addition to heroin has to be people-eating bacteria such as Bacillus anthracis (causes anthrax) and Clostridium botulinum (causes botulism). They produce spores capable of surviving being heated up within a spoonful of heroin before it's injected into a vein or under the skin. In fact, the heat can cause the spores to germinate, priming them for action. Injection provides instant access to a human tissue buffet, and infections brought about in this manner are often horrendous (I highly recommend not doing an image search). Heroin can become contaminated with harmful bacteria during its production, shipment, sale, or use. Cases of anthrax in heroin users living in Western Europe have been explained as being the result of Bacillus anthracis spores getting into the drug as it's moved from Afghanistan via Turkey, possibly from the animal skins in which the drug is smuggled (livestock in the Middle East are occasionally killed by the bacterium) or because bone meal contaminated with spores is used to bulk up the drug prior to selling it. Spores of Clostridium botulinum, naturally found in soil, are thought to get into heroin via the materials added to bulk it up or from dirty tools used to administer the drug. Although C. botulinum requires an environment lacking in oxygen in order to flourish, and the tissues of the human body are typically well-supplied with oxygen via the blood flowing to and from them, a heroin user can inadvertently create oxygen-poor pockets within their body where the bacterium can grow and pump out toxins. Heroin doesn't dissolve well in water, so people looking to inject it into them typically use a solution of citric acid, heated gently, to facilitate dissolution. Repeatedly introducing an acid into the body results in tissue damage and scar formation, reducing blood flow and thus the local level of oxygen. And that's how you get infected with C. botulinum.